The initial state of the User's Configuration window (iconified, maximized, or normal). Start on Time & Date tab window. 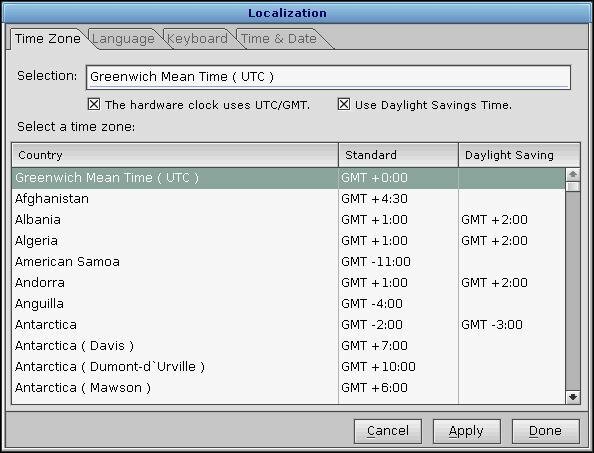 This application is used to set/modify the user localization information such as the timezone, language and keyboard. Photon must be running for this utility to work. Localizing your configuration with phlocale. The changes (except for the language selection) go into effect when you click on the Apply or OK button. Any language change takes effect the next time the user logs into the system. The main user configuration file. The country you're in, based on your selection of the time zone. The selected PhAB language identifier. The keyboard file_name is inserted, so that the correct keyboard definition file is used.